I believe we all have heard many things about North Korea from the media, I am one that don't tend to believe what the media tells me and I have decided to see the infamous country and I thought visiting the country on their national day will make this trip an interesting one. This will be a fully guided trip as we aren't allow to roam or explore the country. Therefore, will we get to see the real North Korea? Let's go with an open mind and learn about this secretive and controversial country. We will begin our journey in Dandong China and cross over to North Korea over the Sino-Korean Friendship Bridge. Let's begin our adventure with the train in Dandong bound only for Pyongyang! 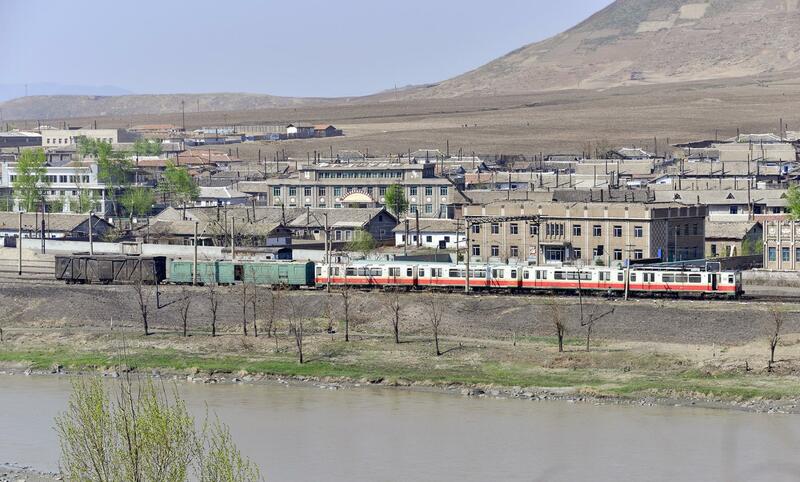 The train that we will be taking to Pyongyang and a town seen during the train ride. 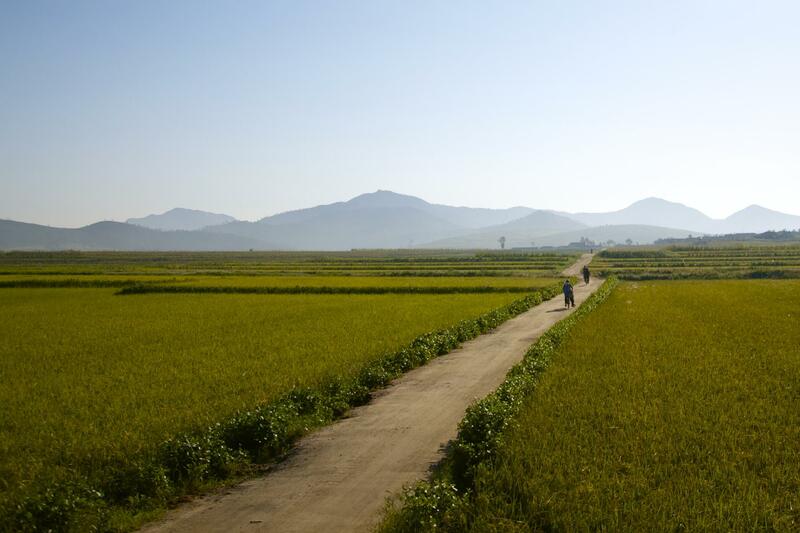 Once we cross the Yalu river, we will see farmlands and more farmlands. It will take us about 7 hours to reach Pyongyang. We will check in to the hotel and rest for the day. If you get the room with the right facing this can be your view from your hotel room. Really? The next day we will visit the famous Panmunjom Truce Village and the DMZ located in historic Kaesong, which is 2.5 hours away from Pyongyang. 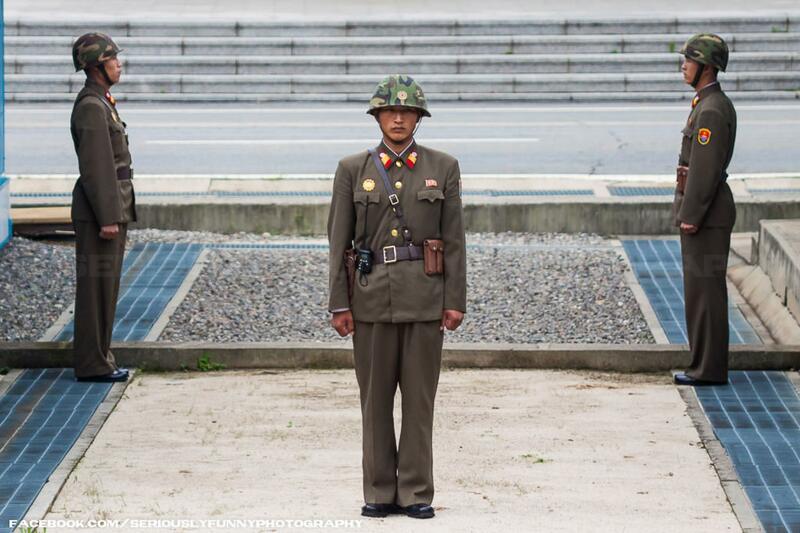 Located in the middle of the 4 km wide Demilitarised Zone, Panmunjom is the site of the signing of the 1953 armistice at the end of the Korean War. This is the only location where visitors can directly view soldiers from both sides and the demarcation line dividing Korea. Kaesong Koryo Museum a UNESCO site, was a Confucian school, but it is now a museum on the Koryo Dynasty exhibiting historical objects, statues, pagodas, and porcelain from that era. 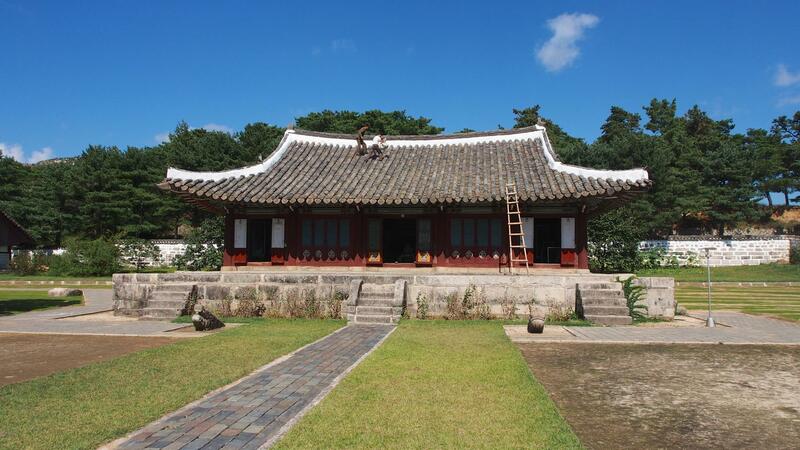 After which we will make our way to Kaesong Schoolchildren’s Palace andTomb of King Kongmin another UNESCO site. 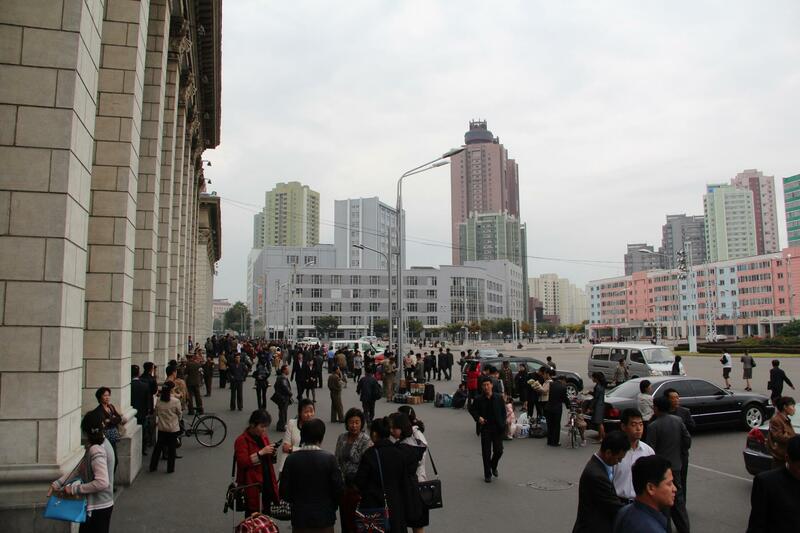 The next day we will make our way back to Pyongyang, before that we will visit Old City Walk and South Gate. Strolling through Kaesong’s historic district lined with homes dating back to the Ri Dynasty to the city’s historic South Gate. We will stop by the Monument to the Three Charters of Reunification, a large stone archway over the highway memorializing joint agreements between north and south. 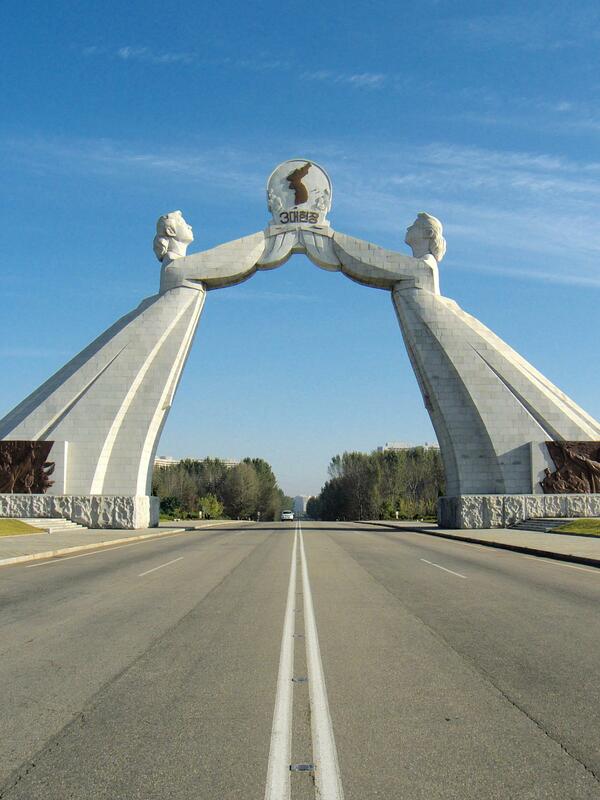 It was opened in August 2001 to commemorate Korean reunification proposals put forward by Kim Il-sung.The concrete arch straddles the multi-laned Reunification Highway leading from Pyongyang to the DMZ. It consists of two Korean women in traditional dress (chosŏn-ot), symbolizing the North and the South, leaning forward to jointly uphold a sphere bearing a map of a reunified Korea. After that moving on to visit the Victorious Fatherland Liberation War Museum. The general character and influence of the museum reflects the official North Korean view of their success in fighting against their American arch-enemy and its puppet-state of South Korea, and much of the museum presents the victories of North Korea and its military over its enemies, which are shown to be utterly defeated and broken by the might of the DPRK. The next day we will visit Kumsusan Palace of the Sun. The mausoleum of the DPRK leadership where President Kim Il Sung and Leader Kim Jong Il lie in state and the most solemn location on the itinerary. Some have described the visit as eye opening and lets see it for ourselves. After the visit to one of the most important place in North Korea, lets visit theirdepartmental storeand Grand People’s Study House.It has a total floor space of100,000m2and 600 rooms. The building can house up to 30 million books, of which it contains around 10,800 documents and books. Foreign publications are available only with special permission. Writings of Kim Jong-il are also included. Almost all materials are kept within closed stacks accessible only to librarians and library staff. A person can search the online or print catalogues to discover what is in the collection. 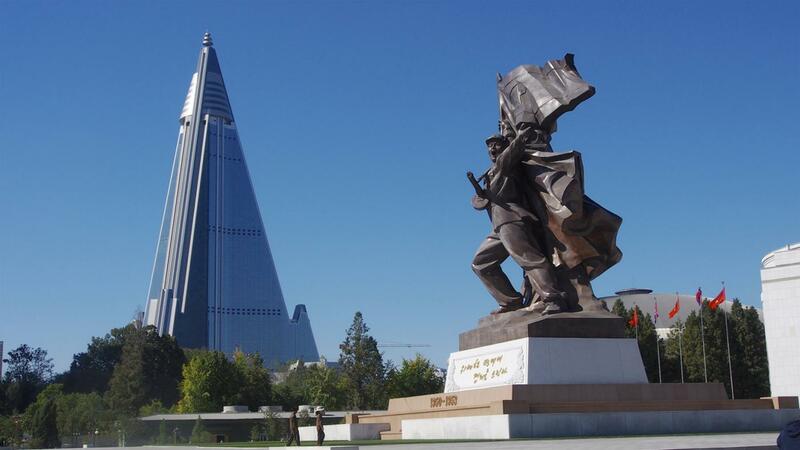 The next day will visit Mansudae Grand Monument, foreigners used to be able to observe the grand statues of the 2 leaders but now it is not possible and we can only observe it from a distance. 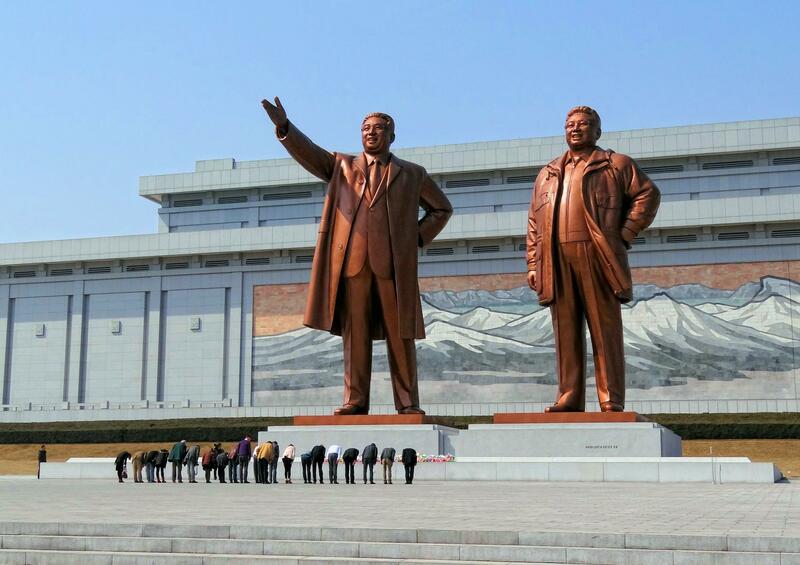 Mansudae Grand Monument, enormous bronze statues of President Kim Il Sung and Leader Kim Jong Il overlooking downtown Pyongyang. A presentation of flowers and bow by the group is customary here as seen in the photo. Next we will ride the metro, visit the Arch of Triumph, Moranbong Park, and finally join in the mass dance with the locals in celebration of their national day. One of the deepest metro systems in the world with stunning artwork reflecting the name of each station. We will ride six stations on the Chollima Line. 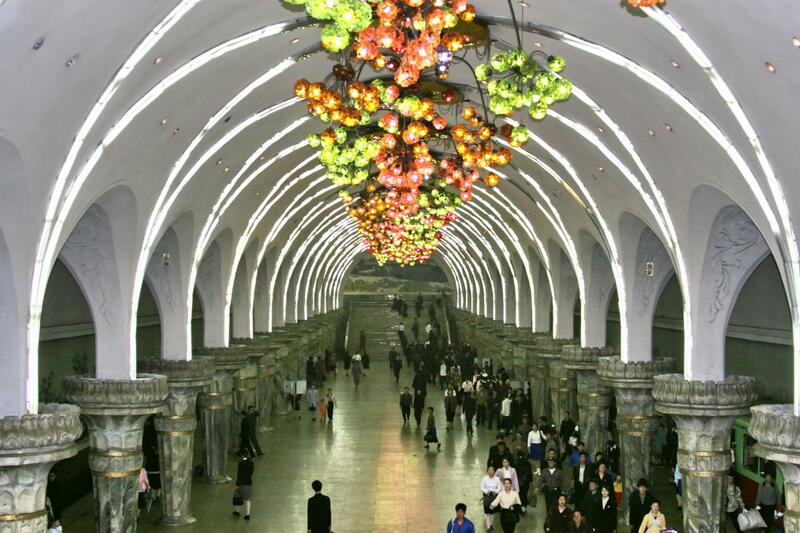 The entrance of metro train station in Pyonyang. Massive archway commemorating the liberation of Korea from Japanese colonial rule. Made for the 70th anniversary of President Kim Il Sung in 1982. 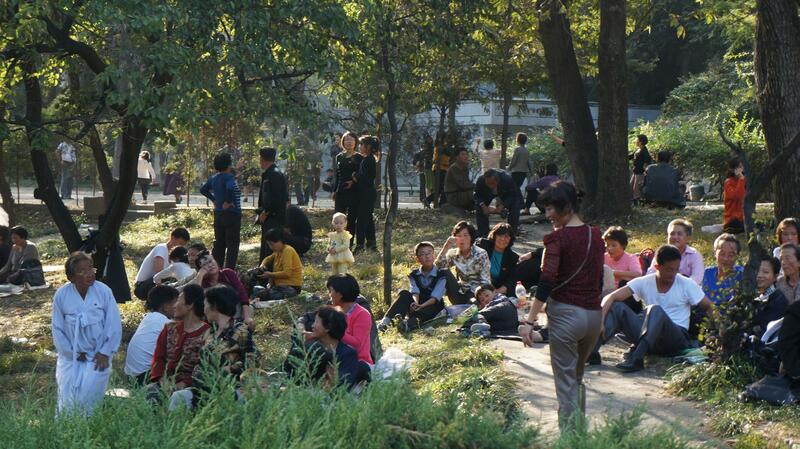 We’ll take a stroll in Pyongyang’s central park popular with locals for picnics, dances, and sports. 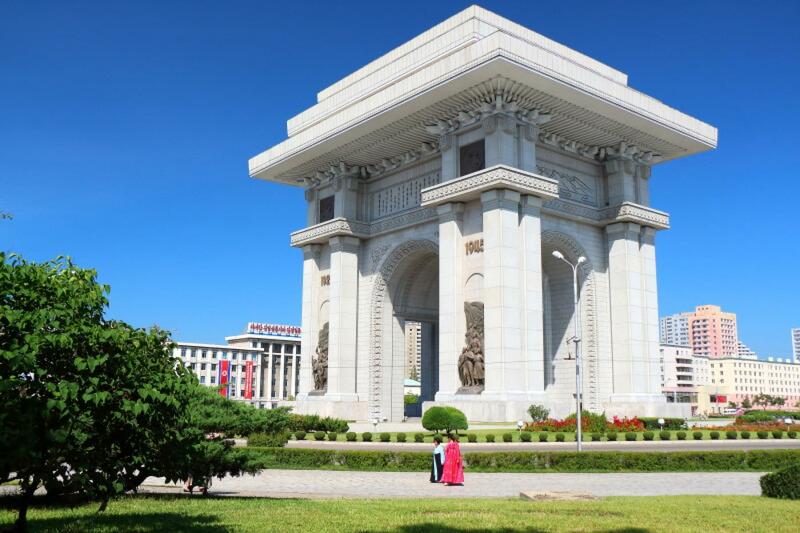 The park is filled with historic pavilions, walls, and monuments - modern and ancient, a few of which are among the traditional ‘Eight Great Sights of Pyongyang’. 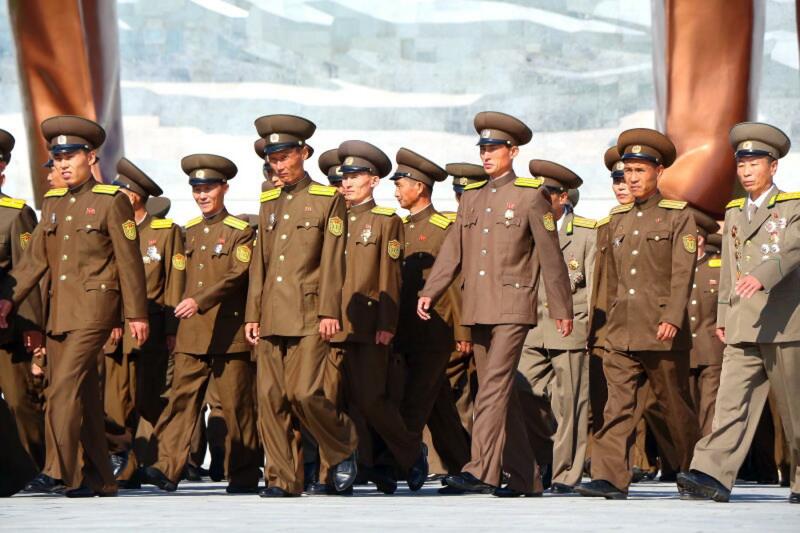 This is possibly a common sight in North Korea as the Army is the largest employer. We will make our way to their central square and join in the mass dance to celebrate their foundation day and also their national day. I hope this will be a fruitful trip and we all learn much more about the world's most secretive country. The itinerary might be changed to flying into North Korea first, then leave the country for Dandong China via the train.